Linke Angus is located on the original family farm in south central South Dakota near Woonsocket – The Town with the Beautiful Lake. 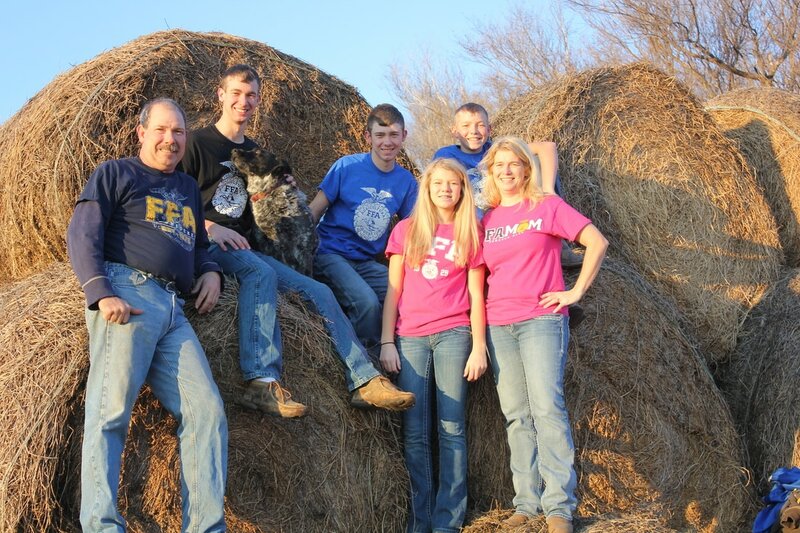 Henry and Paula and their four children (Jonathan, Aaron, Nathan, & Megan) are proud to be a part of the Angus breed by raising registered Angus cattle on their farm. The five generation farm includes a cow herd of about 200 head, as well as corn, soybeans, hay, and alfalfa. The family is active in 4-H, FFA, band, choir, Farmer’s Union, Modern Woodmen, Junior Angus Association, and church activities. All three boys have competed nationally in multiple FFA and 4-H events including livestock and agronomy judging. They have all served as officers in the FFA at the chapter and district level, and Jonathan served as a State FFA Officer. Megan is just getting her start in the organization but is already seeing some early success, with a bright future to come. Especially after his year as a state officer, Jonathan realized a passion for motivational public speaking, and is always looking for groups to speak to. Prior to 2005, the herd was only commercial Angus cows. The beginning of the registered Angus herd began with the purchase of three show heifers for Jonathan from Moore Angus of Artesian. Over the years, the registered herd has grown to around 60 head along with around 140 commercial cows, and includes genetics from several area herds including Edgar Bros., Rock Creek Livestock, Thomas Ranch, and Peterson Angus. A.I. sires are chosen with a balance of performance and phenotype in mind, and a majority of each year’s natural service calf crop is from bulls raised by Linke Angus. We have developed an almost closed herd which has allowed us to develop a very uniform set of cattle.